Woke up and went searching for my charger/adapter. Backtracked all the way to the campsite with the Rottweiler. Shouldn’t you know, laying where I picked up my sock. Extra bonus, found Brian’s missing sock in the jersey I took out to wear. Laundry mishap from the day before. All was right. The bike/ybike site had thirteen tents and lots of couples, probably 20 or more total. They were all getting a slow start, I was the only one up until 7:30, but they all headed out by about 8:30. We got on the road at the usual 9:00. Right out of Manzanita, we had the biggest climb. Ugh! Then the 101 became a series of rolling hills until we turned off into Seaside. This town was hopping like a weekend. We were drawn into the Pig n Pancake for brunch. Pecan sourdough (award winning) pancakes, eight of them, with maple and Marion berry syrup. Delicious. 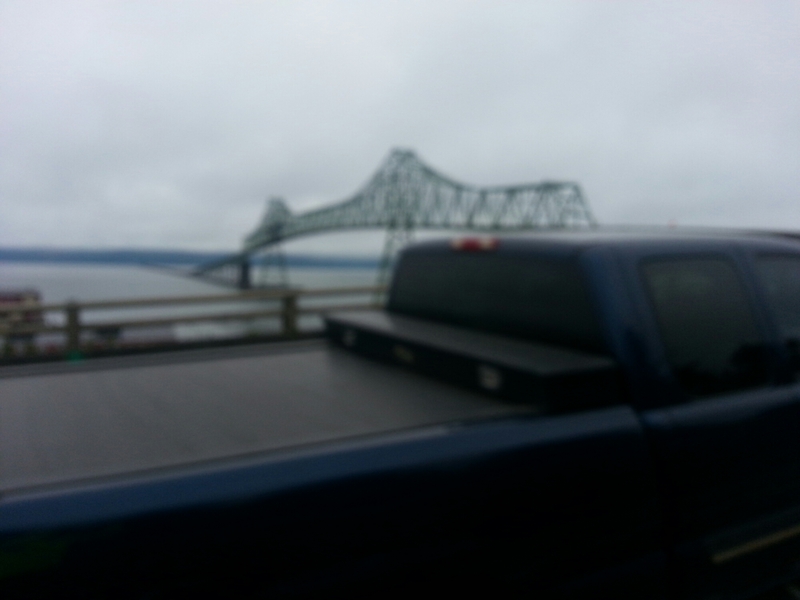 We jumped off the 101 onto Lewis and Clark Road. What a relief! Despite the hills, it was scenic and few cars buzzing by. They only danger was the deer in the road that stopped Brian. My bell spooked it. Brian is the only one eschewing a bell. Maybe be should have called out “On your left”! 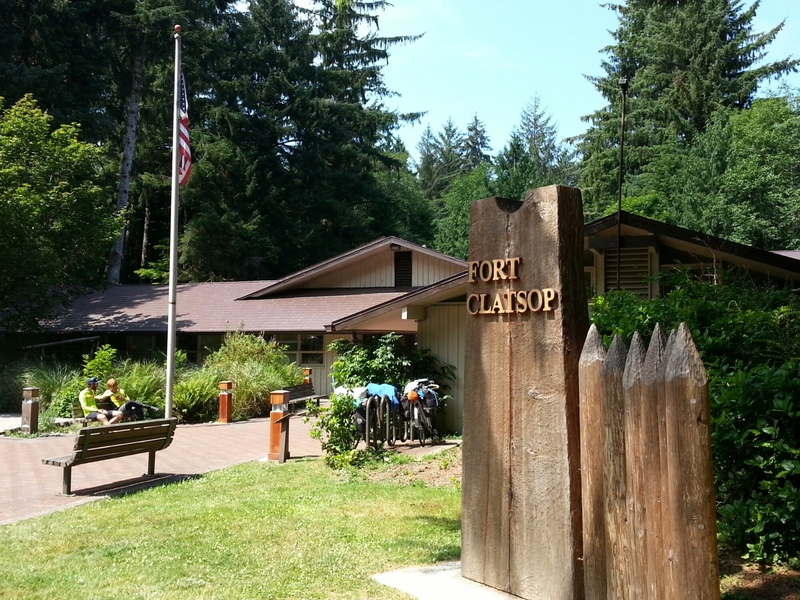 Along the L&C road is Fort Clatsop. An outpost started by Lewis and Clark. I got to use my Senior Passport for National Parks for the first time, saved us $12 and about paid for the card. 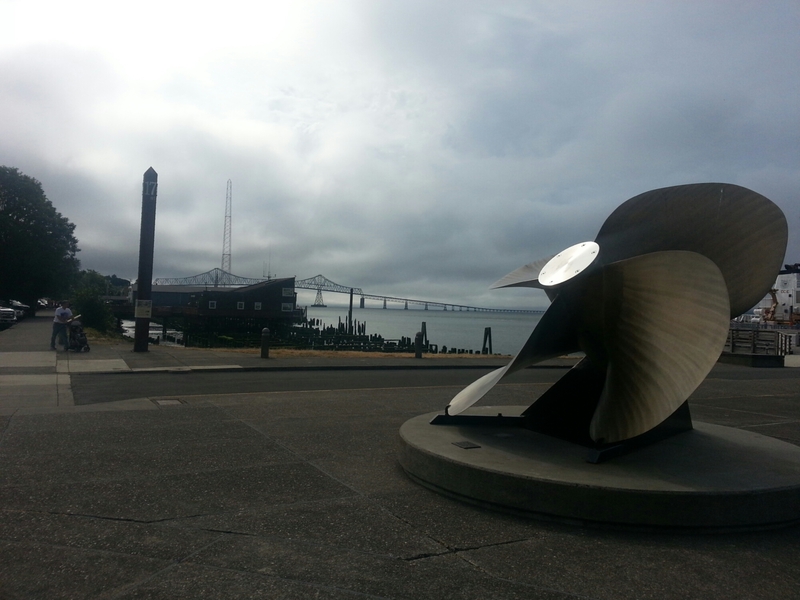 It was a short detour, literally, to Astoria. The looooong bridge across the Columbus River starts there. Only Bob, who has the fattest tires, got caught. 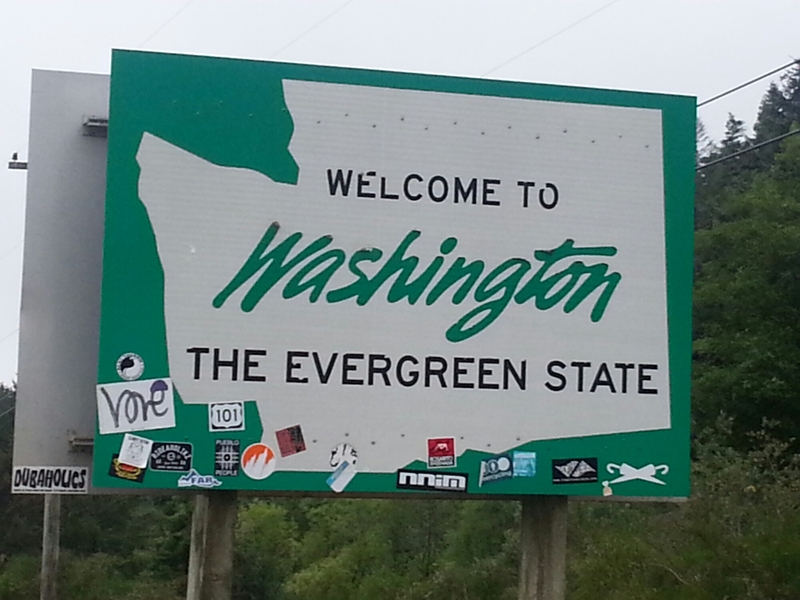 As soon add we crossed over (not a problem), we got our taste of Washington, a misty drizzle that won’t get you wet but will cause drops to form on your glasses and drips from your helmet. Even the sign is disappointing… isn’t that two umbrellas crossed on the lower right corner? We went about a dozen miles and made camp at a KOA. About the same price as hike/bike at Cape Disappointment. 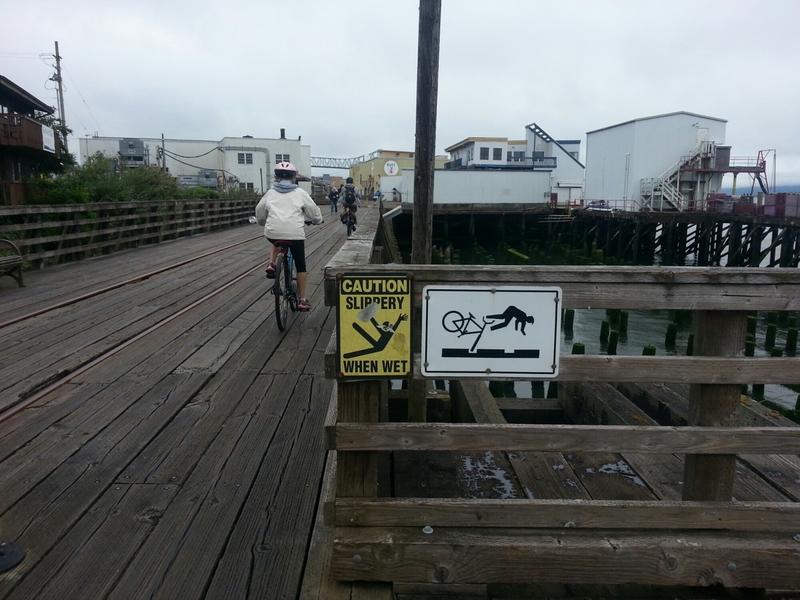 Once we crossed the bridge, we were officially off of the Adventure Cycling maps as they go further east towards Seattle. 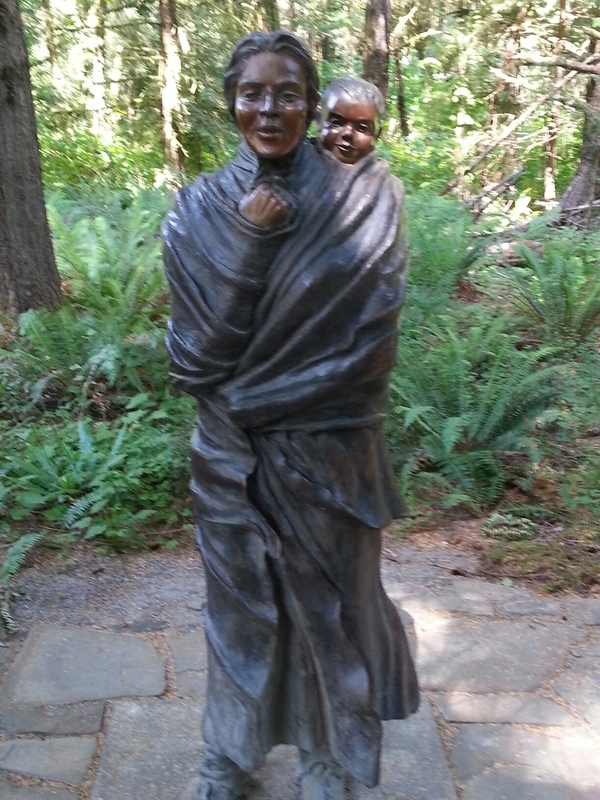 Our plan is to circle the Olympic Peninsula, ferry to Victoria Island and then to Vancouver, eventually making our way back to Seattle, time allowing. That will probably be my plan regardless, as I don’t have the wedding constraint.